In hierdie artikel word die belang van tegniek vir 'n aanvaarbare perspektief op die menslike agentskap (en dus ook op die gees van die mens) op 'n beskrywende en kritiese manier aangebied. Die polemiese gebruik van die term "tegnologie" dien as afgrensing teen drie wydverspreide wanopvattings aangaande tegniek: (1) teen die ideologiesgedrewe benaderings tot menslike tegnisiteit, naamlik tegno-pessimisme en tegno-optimisme, (2) teen die foutiewe oortuiging dat behoorlike aandag aan menslike tegnisiteit noodwendig lei tot 'n instrumentale degradering van die mens en (3) teen die oordrewe isolering van menslike tegnisiteit ten opsigte van ander aspekte van menswees, soos die simboliese, sosiale of biologiese aspekte. Dienooreenkomstig word: (1) 'n genuanseerde beeld van menslike tegnisiteit aangebied, (2) aangetoon hoe tegnisiteit wesenlik deel van menslike bestaan is en (3) die verweefdheid van menslike tegnisiteit met ander antropologiese aspekte ondersoek. Uiteindelik word die kritiese potensiaal van 'n nie-teleologiese begrip van die tegnisiteit van menslike aksie gekartografeer ten einde die relevansie van "tegnologie" vir die geesteswetenskappe te demonstreer. In this article the significance of technics for an acceptable perspective on human agency is presented in a descriptive and critical manner. The principal descriptive strategy adopted in this study is to approach technicity as an aspect of human agency, rather than to explore technical action in the framework of an action typology. Correspondingly, "technology" is presented as the study of the technicity of human action. In the centre of such a study is an exploration of technicity as major characteristic of the human body, the coinciding use of means and/or the pursuit of different forms of excellence. This polemical use of the term "technology" serves the purpose of opposing three recurrent misconceptions regarding technics: (1) the ideologically driven approaches to human technicity, namely techno-optimism and techno-pessimism, (2) the erroneous conviction that thorough attention to human technicity necessarily implies the instrumental degradation of the human being, and (3) the excessive isolation of human technicity with respect to other aspects of being human. The constructive response to these three critical points, are as follows: first, a nuanced image ofhuman technicity is provided. Bodily technics (techniques du corps) are the growing and evolving series of capabilities that are gradually sedimented in the body of a developing human being. These capacities are acquired under cultural specific regimes of encouragement and sanction. They are also steady dispositions to act in certain ways, when confronted with certain kinds of context, without, however, being determined by these contexts. Furthermore, the bodily technics is the manner in which an agent is acquainted with the world, in the sense of having a non consciousness centred, practical know-how of the world. Second, the particular human character of technicity is studied in three ways. (i) It is demonstrated that there is no disposition to rule following behaviour in human beings that does not stand under the influence of judgement, adaptation to a context and the exercise of capabilities under the restrictions of inabilities. (ii) Subsequently the hermeneutic spiral involved in the technicity of all action is explained. A three-fold meaning is uncovered in the interpretation, which is part of the technicity of action: the technical meaning (in a narrow sense), the meaning of usage and the symbolic meaning. (iii) Finally, the mutual implication of technicity and creativity is explored. It is argued that the technicity of action is to be understood as a non-teleological capacity, before the subsequent teleological capability (usually associated with the instrumental reason in action typologies) is taken into consideration. Drawing from the work of Hans Joas, it is demonstrated that without this teleological capability, the human being would be simply determined in a behaviouristic manner by the forces of the environment, in other words, the teleological capacity (as development of our primordial technicity) creates room for creativity. Furthermore, the capacity for creative intervention in the world presupposes the non-teleological capacity of primordial technicity. Third, the interwovenness of human technicity with other anthropological aspects is examined. Five aspects of human existence are dialectically implicated with human technicity: the biological constitution, the constructed technical system, the acquisition of know-how through socialisation, associative action and the symbolic and linguistic order. The critical potential of a non-teleological notion of the technicity of human action is mapped in the last section in order to demonstrate the relevance of "technology"for the humanities and for the social sciences in particular. Stated negatively, the critical thrust of technology is aimed against the technicist reduction (ie the reduction of human technicity to a specific type of action, which is warped by the teleological prejudices against the nature of human technicity) and against the anti-technical marginalisation of human technicity (ie the attempt to expel technicity from being human or to limit it to certain kinds of action). These two tendencies of misrepresentations of human technical agency usually lead to techno-optimism and techno-pessimism, respectively. Stated positively, technology as critical discourse on human technicity is guided by the desire to gain insight into the full potential for the development of human agency, since this is a condition for the possibility of ethical as well as moral and political excellence. In this sense, technology (in the sense used here) has a critical social scientific ambition. An overview of possible pathologies of techno-pessimism and techno-optimism is plotted in tabular form against the five dialectical relations between human technicity and other aspects of human existence (as referred to above). The underlying structure of the table presents these two categories of practical techno-pathologies in an Aristotelian way as the excesses and deficiencies associated with warped perspectives on human technicity. Furthermore, as in Aristotle 's practical philosophy, the two vices give an indication of the midway between them that is to be pursued in all practical contexts as the way of excellence. This midway ideally recognises the true spirit or humaneness of human technicity, by according to it, its rightful place. One of the characteristics of excellence in human action is the capability to do justice to this spirit of human technicity in the divergent contexts of practice and under different regimes of justification. Here, "doing justice " refers only secondarily to what is done after action, retrospectively by social scientists; primarily it refers to excellence in human practice. "Is Saul dan ook onder die profete? ", sou my leser dalk kon wonder na aanleiding van die artikel se opskrif. As ons wil besin oor die toestand van die "gees" van die geesteswetenskappe, is dit dan nou nodig om met die tegnologie deurmekaar te raak? Ek nooi die leser uit om vir die duur van die artikel na die woord "tegnologie" te luister, soos mens "kriminologie" of "sosiologie" of "antropologie" aanhoor. Dienooreenkomstig sal "tegnologie" 'n intelligente diskoers aangaande tegniek, dit wil sê aangaande die menslike vermoë tot tegniese aksie en die aanwending van daardie vermoë in koördinasie met tegniese artefakte, wees. Dit is nie werklik my doel om hier 'n nuwe vakgebied in die lewe te roep nie; die bedoeling van hierdie effens provokatiewe titel is meer polemies: ek rig my in hierdie artikel teen die verwaarlosing van tegniek wat soms in die menswetenskappe voorkom en teen die masjinistiese reduksie van tegniek as 'n aspek van menslike bestaan wat meer dikwels in ander vakgebiede gemaak word. Die onderliggende hipotese van alles wat volg, asook die regverdiging van my bydrae tot die huidige bundel, is dat 'n verwaarlosing of verwringing van menslike tegnisiteit 'n wandaad teen die menslike gees1 behels en verwaarlosing of verwringing van die mens tot gevolg het. Daar moet uit die staanspoor toegegee word dat daar 'n lang en eerbare tradisie van studie en nadenke oor tegniek in meeste geesteswetenskappe bestaan. Argeologie, antropologie, geskiedenis en kultuurstudies is haas ondenkbaar sonder die kollegas wat aan hierdie aspek van hulle dissipline werk. Daar sal egter ook toegegee moet word dat tegniek selde die voorgrond van die geesteswetenskaplike dissiplines inneem op die manier wat die rede, taal, politiek of ontwikkeling dit doen. Heel dikwels word "tegnologie" as 'n geringer onderafdeling van dissiplines behandel (of nie behandel nie). Ten einde die plek van 'n volwaardige diskoers aangaande menslike tegnisiteit aan te dui, is 'n strategiese metodologiese skuif nodig: in plaas daarvan om primêr aan tegniek te dink as 'n sekere tipe ding wat bestudeer kan word, moet ons primêr daaraan dink as 'n invalshoek op die hele menslike werklikheid. Hierdie voorstel word gemaak deur André-Georg Haudricourt in sy boek La technologie science humaine - Tegnologie as menswetenskap - wat ook tot inspirasie vir die titel van die huidige artikel gedien het (Haudricourt 1987:37). Mens kry 'n onmiddellike, intuïtiewe blik op die waarde van hierdie benadering deur eenvoudig te vra: "Wat is tegniek?". Ek ontken hoegenaamd nie die waarde van studies wat onderneem is om op hierdie vraag vanuit 'n tipologie van die objek te antwoord nie. In filosofie is 'n reeks klassieke antwoorde op hierdie vraag bekend: tegniek of tegnologie is hardeware, dit is reëls, dit is 'n sisteem, of dit is toegepaste wetenskap (sien die oorsig van Dusek 2006:31-35, wat veral die analities-filosofiese pogings verteenwoordig) of tegniek is in wese protese, orgaanverlenging, eksternalisering van die gees, realisering van idees (uit die oorsigte van Hartmann 2003 en Lenk 1982:19-22, wat klassieke kontinentale sienings opsom).2 Daar is uiteraard baie by al hierdie teorieë te leer. Die waarde van 'n klem op "tegnologie" as invalshoek om die menslike werklikheid te ondersoek, word egter duidelik wanneer 'n mens net vir 'n oomblik dink wie op hierdie vraag antwoord. Vir die jong egpaar is tegniese artefakte die middele waarmee hulle tyd spaar en vir hulle vriende kan wys dat hulle deel van 'n bepaalde middelklasgroep geword het; vir die patent-agent is tegniese artefakte die opmars van nuwe uitvindings wat deur billike wetgewing en toereikende registrasie beskerm moet word; vir die musikant is tegniese middele die onmisbare bondgenoot in die voortbring van roerende klanke; vir die bejaarde is tegniese produkte die sprankel van die jeug of die middel waardeur sy of haar tradisionele gesag gerelativeer en ondermyn word ('n soortgelyke punt word in 'n andersins teleurstellende opstel gemaak deur Richard Li-Hua 2009:18). Dit wat tegnologie is en dit wat verskillende tegniese aktiwiteite en artefakte vir verskillende mense in verskillende situasies is, hang af van watter persoon in watter konteks op 'n bepaalde manier met tegniese middele optree. En omdat ek die basiese oortuiging van fenomenologie en die daaruitspruitende hermeneutiek onderskryf - naamlik dat alle vorme van menslike bestaan, vorme van openheid tot die wêreld is, en as sodanig legitieme gronde vir kennis aangaande die wêreld is (sien Husserl 1993:§24) - moet alle vorme van interaksie met die wêreld, asook die tegniese bemiddeling van aksie, vir die studie van "tegnologie" van belang wees. Vanuit hierdie perspektief is "tegnologie" in die eerste plek die studie van die tegnisiteit van menslike aksie, waar tegnisiteit verwys na 'n kwaliteit van die lyf, die ooreenstemmende gebruik van instrumente en/of die strewe na vorme van uitmuntendheid (soos uit die res van die artikel sal blyk). Teen die agtergrond van hierdie voorlopige aanduiding van wat met tegnologie bedoel word, kan die polemiese inslag van "tegnologie" beskryf word as gerig teen drie wydverspreide wanop-vattings aangaande tegniek: (1) teen die ideologiesgedrewe benaderings tot menslike tegnisiteit, naamlik tegno-pessimisme en tegno-optimisme, (2) teen die foutiewe oortuiging dat behoorlike aandag aan menslike tegnisiteit noodwendig lei tot 'n instrumentale degradering van die mens en (3) teen die oordrewe isolering van menslike tegnisiteit ten opsigte van ander aspekte van menswees, soos die simboliese, sosiale of biologiese aspekte. Positief gestel: die doelstelling van "tegnologie" is om: (1) 'n genuanseerde beeld van menslike tegnisiteit te bied (sien veral §§ 2 & 3), (2) die manier waarop tegnisiteit wesenlik deel van menslike bestaan is, te verhelder (sien veral §4) en (3) die verweefdheid van menslike tegnisiteit met ander antropologiese aspekte te ondersoek (sien veral §5). 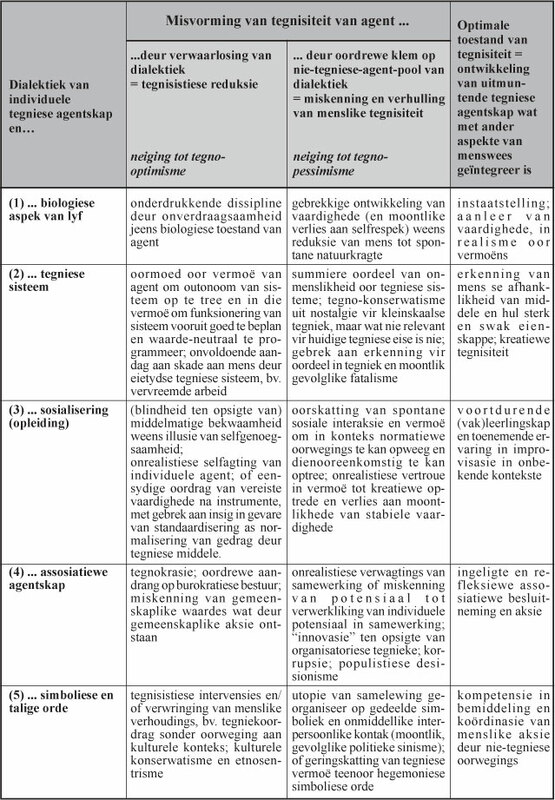 Habitus of die lyftegnieke is, soos algemeen bekend, 'n belangrike onderdeel van die dissiplines van sosiale teorievorming (soos byvoorbeeld in die bekende werke van Mauss  1993 en Bourdieu 1980:87-109); maar dit is ook die invalshoek op die verskynsel van tegniek wat die definitief menslike aard en breë voorkoms van tegniek blootlê (soos betoog in Wolff 2010). Dat die mens in staat is om sy of haar eie lyf of die lywe van ander te dissiplineer totdat dit sekere aksies tot 'n hoë vlak van effektiwiteit en by herhaling kan uitvoer, is al lankal aan die mensdom bekend en die moderne vrese vir masjien-agtige, gestandaardiseerde, verstandlose aksie is op komiese wyse in Charlie Chaplin se Modern Times vasgevang. Dit is hoegenaamd nie my bedoeling om die gruwel van Fordistiese en Tayloristiese arbeidsbestuur of die tirannieke eenvormigheid van aksie soos versinnebeeld in militêre parades of in kykspele van kommunistiese massagimnastiek te vergoeilik nie. My punt is eenvoudig dat 'n behoorlike studie van die lyftegnieke sal aantoon dat vervreemde arbeid langs 'n produksielyn nie die figuur is wat ons toegang gee tot die begrip van menslike tegnisiteit nie, tewens, ons verontwaardiging oor die feit dat baie mense onder sulke omstandighede moet werk, is eintlik net begryplik teen die agtergrond van die volle beeld van tegniese agentskap, waartoe die studie van lyftegnieke toegang gee.5 Ek is nie oortuig dat die navorsingsmetodes van dissiplines buite die geesteswetenskappe mens in staat sal stel om hierdie aspek van tegniek behoorlik in die oog te kry nie en die uiteensetting hieronder behoort as regverdiging vir my wantroue te dien. Dit wat dus vir ons toegang tot tegnologie as sosiale teorie gee, is die lyftegnieke as die oorsprong van alle mense se agentskap. Wat mense gewoonlik omkrap, is juis dat die reëlmatigheid, patroonmatigheid en standaardisering wat lyftegnieke aan aksie verleen oënskynlik die spontaneïteit, kreatiwiteit en wispelturigheid - die "gees" van menslike aksie - versmoor deur dit tot masjienmatige herhaling te verdom. Maar die bestendigheid van die lyftegnieke en die reëlmatigheid wat dit aan menslike aksie verleen hoef nie uit die staanspoor as degraderend vir die mens gesien te word nie; feitlik alle vorme van menslike effektiwiteit is daarvan afhanklik: om stil te sit en aandagtig te luister, om viool te speel, om geduldig te bly onder stres, om tennis te speel, om betyds te kom vir 'n afspraak, om nie eers te praat van al die aktiwiteite wat meer ooglopend met die gebruik van tegniese artefakte te doen het nie. 'n Versigtiger ondersoek sal toon dat die verskynsel van standaardiseringsdwang 'n marginale (en, toegegee, dikwels patologiese) vorm van menslike tegnisiteit verteenwoordig. Hierdie punt kan op drie maniere betoog word; drie maniere waarop die "gees" van menslike tegnisiteit na vore gebring kan word: deur die spesifiek menslike vorm van reëlvolging te ondersoek (§3.1), deur die hermeneutiese aspek van aksie bloot te lê (§3.2) en deur die wedersydse implikasie van tegnisiteit en kreatiwiteit te ondersoek (§3.3). Daar is met ander woorde geen disposisie tot reëlmatige aksie wat nie onder die invloed van die gees van oordeel, aanpassing aan 'n konteks en die beoefening van vermoë onder die beperkings van onvermoë, staan nie. Met die verwysing na oordeel, is die hermeneutiese aspek van die tegnisiteit van optrede reeds genoem - dit moet nou verder ondersoek word. Mens sou kon aantoon dat tegnisiteit, soos dit in aksie ontvou, 'n hermeneutiese spiraal volg vanaf die lyftegnieke, deur die tegniese middele en produkte, na wêreldlikheid - of, in ander woorde, 'n hermeneutiese proses van die verstanende en interpreterende interaksie van die tegniese agent met tegniese middele.8 Wanneer, byvoorbeeld, die fietsryer met 'n fiets fietsry, is 'n mens wat oor aangeleerde lyftegnieke beskik besig om 'n hele stel goed te interpreteer: homself/haarself, die fiets, die omgewing, die aktiwiteit van fietsry. Hierdie proses is nie heeltemal verskillend van iemand wat 'n boek lees nie. "Lees" kan gebruik word as metafoor om die verhouding tussen 'n vaardige lyf en tegniese middele te ontsluit. In elke aksie word die moontlikhede van 'n spesifieke agent, binne daardie konteks en deur bemiddeling van die betrokke tegniese middele prakties geïnterpreteer. Dat hierdie interpretasie verder strek as bewuste strategiebeplanning en altyd berus op die vooraf verworwe vertroudheid met aksie in die wêreld, is hierbo reeds aangetoon. Die vertroudheid wat as aangeleerde en ontplooibare vaardighede bestaan, word telkens deur die ontplooiing daarvan her-ingeoefen, met die gevolg dat die punt vanwaar tegniese gebeure "gelees" word, voortdurend op subtiele wyses verander. Verder is die gebeure van tegniese "lees" onderworpe aan die invloed wat herhaling daarop kan hê: leer, bemeestering, moegheid, verveling en dies meer. Dit moet ook uit die staanspoor in gedagte gehou word dat aksie altyd sosiaal gekonstitueer is en heel dikwels saam met ander uitgevoer en dus geïnterpreteer word. Dit behoort gou duidelik te word dat die betekenisse wat uit hierdie tipe proses van interpretasie in aksie "afgelees" word, nie tot die tegniese betekenis daarvan gereduseer kan word nie, ten spyte daarvan dat ek die klem gelê het op die tegnisiteit van die agent, van die middele en van die aksie. Mens sou, tewens, drie tipes betekenis of verwysings kon onderskei, wat in die hermeneutiese vesel van menslike tegnisiteit verweef is: (1) Die tegniese betekenis (in 'n eng sin) van die tegnisiteit van menslike aksie dui op die begrip van die interne verwysing van die verskillende komponente van tegniese prosedures tot mekaar, of dit nou die onderdele van instrumente is of die koördinering van vaklui - om dit eenvoudig te stel, dit is die begrip van tegniese gebeure soos dit op 'n vloeidiagram voorgestel kan word en waar die verbande gelê word op grond van die tegniese eienskappe van die komponente van die proses. (2) Die gebruiksbetekenis van die tegnisiteit van aksie ontstaan binne die kader van 'n projek; deurdat 'n tegniese middel as 'n dit of 'n dat gebruik word, met die oog op die suksesvolle uitvoering van die aksie. Met die verloop van die uitvoering van 'n taak, kan die projek ook aangepas word en word die gebruiksbetekenis van elemente van die proses verander. (3) Alle tegnisiteit het laastens ook 'n simboliese betekenis, waardeur tegniese aksie sosiale waardes bevorder of frustreer. Dink hier byvoorbeeld aan presisie, skoonheid, mode, sofistikasie, verbruikbaarheid, ens. Dit is die gebruiksbetekenis en die simboliese betekenis wat die wêreldlikheid van tegniek vorm. Hierdie twee vorme van betekenis bly egter onlosmaaklik verweef met die tegniese betekenis (in die eng sin). Dat die hermeneutiese spiraal van tegniek, waardeur hierdie drie interafhanklike vorme van betekenis werkend word, 'n integrale deel van ons menslike bestaan is, sal ek nie hier betoog nie, maar eenvoudig met twee feite illustreer. (I) Alle mense speel voortdurend 'n reeks relatief stabiele, sosiaal- en simbolies-gevormde, tegniese rolle: van beroepe tot rolle van geslag of ouderdom -geeneen kan begryp word sonder die hermeneutiese spiraal van tegnisiteit wat hierbo beskryf is nie. Elkeen van hierdie rolle het 'n stel spesifieke lyftegnieke, tegniese middele, kriteria van uitmuntendheid en dies meer, maak nie saak of dit gaan oor om met hoëhakskoene te loop, om 'n stywe handdruk te gee, met die stemtoon van 'n radio-omroeper te praat, om te sit en luister na 'n lesing, of wat nog nie. (II) Dit wat alledaags as goeie optrede beskou word, kan nie beoefen word sonder die aanleer van deugde nie en deugde word in kontekste van tegniese aksie aangeleer en verbeter. Waar sou mens die vermoë aanleer om op te tree met geduld, spaarsamigheid, getrouheid, bestendigheid, uithouvermoë, noukeurigheid, as dit nie is deur dit aan te leer in prosesse van tegniese interpretasie nie? Is dit nie een van die deugde wat die aanleer van klavierspeel, ysskaats en metaalwerk vir ons bybring nie? Uit al twee hierdie illustrasies (die verskynsel van tegniese rolle en die eienskappe van voortreflike optrede) moet dit duidelik wees dat, hoewel hulle simboliese karakter miskien eerste opval of vir baie mense die interessantste mag wees, dit eenvoudig ontoereikend is om hulle sonder die aspek van tegnisiteit voor te stel. As die algemene idee van tegniese aksie as die teenoorgestelde en selfs bedreiging van kreatiwiteit reeds deur die vorige twee punte (die aard van reëlvolging en interpretasie in tegniese aksie) geproblematiseer is, dan kan hierdie idee heeltemal ontwrig word deur na menslike tegnisiteit te kyk vanuit die perspektief van kreatiwiteit. Die werk van Hans Joas oor die kreatiwiteit van aksie (Joas 1992) is hierin van onskatbare waarde. In stede daarvan om kreatiwiteit te beskou as die laaste in 'n tipologie van aksies (om die waarheid te sê, Joas rig hom eksplisiet teen die beginsel van tipologiestigting, 1992:213), waar kreatiwiteit in elk geval as afgewaterde vorm van rasionele aksie beskou word, ontwikkel Joas 'n teorie van kreatiwiteit as 'n dimensie van alle menslike aksie (ibid.). Kreatiwiteit is dienoor-eenkomstig 'n dimensie van al die hooftipes aksie, soos wat dit in aksietipologieë uiteengesit word, of dit nou instrumentele aksie of normatiewe aksie is. Só gesien, is kreatiwiteit gesitueer in die ononderbroke vloed van alledaagse aksie, wat fluktueer tussen die ondeurdagte roetine-optrede en die episodes waarin hierdie gemaklike alledaagse voort-doen gefrustreer en uitgedaag word. Omdat aksie dus voortdurend bekende en onbekende aspekte met mekaar moet versoen, is daar 'n voortdurende behoefte aan heroriëntasie; die vermoë van 'n geroetineerde agent om in aksie aan te pas by veranderende en onverwagse kontekste, is kreatiwiteit (Joas 1992:190). Kreatiwiteit word dus - in aansluiting by die Amerikaanse pragmatisme9 - eerder vanuit aksie as vanuit die bewussyn bedink (ibid.). Ten einde die kreatiwiteit van alle menslike aksie te begryp, plaas Joas dit teen die agtergrond van sy kritiek van die dominante middel-doel-skema van rasionele aksie. Teorieë wat so 'n idee van rasionele aksie as uitgangspunt vir aksieteorie neem, veronderstel "dat die agent, eerstens, in staat is tot doelgerigte optrede, tweedens sy/haar lyf beheers en, derdens, as outonoom teenoor medemense en die omgewing staan" (Joas 1992:217). Gevolglik hersien Joas "die intensionele aard van menslike optrede, die lyflikheid en die oorspronklike sosialiteit van die menslike vermoë tot aksie" (ibid.). 'n Ondersoek van eersgenoemde is genoegsaam om die verband tussen tegnisiteit en kreatiwiteit uit te wys. Onderliggend aan die idee dat aksie die beste vanuit die doel-middel-skema verstaan kan word, is die aanname dat menslike kennis eerstens bestaan en ontstaan vanuit die denkende subjek wat deur seleksie en ordening 'n verhouding tot 'n wêreld van feite (Tatsachen) daarstel en dat menslike intelligensie dus primêr uit die kenvermoë bestaan (Joas 1992:230-231). Die natuurlike-of aanvangstoestand van die mens sou dus een van rus wees waartydens die vryblywend waarnemende en berekenende subjek doelstellings beraam, wat volgens die eis van rasionaliteit verkieslik so min moontlik deur gewoonte, tradisie of die versoeking van direk-beskikbare middele gekompromitteer word. Hierdie teleologiese beskouing van aksie vertrek dus vanuit die aanname van 'n kennende en planberamende subjek wat vry van lyf, konteks en andere, oor doele en dienooreenkomstige middele vir aksie besin (Joas 1992:231-232). Om hierdie aanname uit te wys is nie om te ontken dat mens oor optrede kan nadink of dat agente van middele gebruik maak ter wille van effektiwiteit nie, maar om die verheffing van die teleologiese model van aksie as die sentrale perspektief op aksie as sodanig te bevraagteken. Hierdie taak word deur Joas onderneem deur te erken dat besinning deel is van die konstante stroom van aksie wat die alledaagse lewe opmaak en deur die noodwendige lyflikheid, situasie-betrokkenheid en sosialiteit van aksie as primêre gegewens te respekteer. Dinge is vir mense eerstens toeganklik deur praktiese interaksie. En hierdie voortdurende praktiese interaksie berus op die lyflike, strewende gerigtheid op ons kontekste van optrede, wat wederom net gebeur vanuit vermoëns, gewoontes en omgewingsverhoudings van die lyf (Joas 1992:232).10 Die belang van hierdie punt in Joas se betoog moet nie onderskat word nie, aangesien hy op grond daarvan sou moes erken dat die tipe nie-teologiese aksieteorie wat sy idee van kreatiwiteit onderlê, die tegniese liggaam, in terme baie naby aan wat ek hierbo onder die noemer van lyftegnieke gebied het, veronderstel. Gevolglik sou Joas moes toegee dat daar geen kreatiwiteit is, as dit nie innovering is op grond van 'n vertroude verhouding tot die wêreld nie en laasgenoemde bestaan net danksy primêre tegnisiteit. Dit is juis op hierdie punt waar my betoog met dié van Joas oorvleuel. Hierdie punt kan ook langs 'n ander weg, vanuit Joas se eie denke oor die instrumentele of liewer teleologiese aspek van aksie, betoog word. Soos hierbo gestel, verdedig Joas die pragmatistiese oortuiging dat refleksie oor aksie, objektivering en bewuste doelstelling organies uit die mislukking en frustrering van strewende aksie groei. En dit is juis die momente waaruit die herstrukturerende en innovatiewe werking in aksie wat as die kreatiewe aspek van aksie bekend staan, ontwikkel. Die wyse waarop Joas daaropvolgend die teleologiese vermoë (dit wil sê die vermoë tot die berekening van strategiese seleksie en inspan van middele ten einde 'n vooraf-bepaalde doel te bereik) as afgeleide van hierdie meer oorspronklike beskouing van aksie blootlê, hoef ons nie hier besig te hou nie. Dit is wel belangrik dat die teleologiese vermoë 'n onmisbare rol speel om te verhoed dat Joas se latere aandrang op die konteksgesitueerdheid van aksie nie tot 'n pleidooi vir 'n behavioristiese determinasie verword nie. Die spontane kreatiwiteit wat aksie oorspronklik kenmerk en die teleologiese vermoë wat 'n sekondêre afgeleide daarvan is, staan in 'n verhouding van wedersydse veronderstelling in menslike aksie (1992:236). Dit sou myns insiens die verkeerde gevolgtrekking wees om hieruit af te lei dat tegniek dus 'n sekondêre vorm van aksie is, omdat die aard daarvan uit die oorspronklike kreatiewe aspek van aksie afgelei sou wees (en dít, selfs al sou mens met Joas toegee dat daar 'n verhouding van wedersydse veronderstelling tussen kreatiwiteit en teleologiese berekening bestaan). Of om dit anders te stel: wie menslike tegnisiteit situeer binne die teleologiese vermoë as afgeleide van oorspronklike kreatiwiteit van aksie, het die mees oorspronklike verskyningsvorm van tegniek reeds misgeloop. Ek het hierbo aangetoon dat die tipe nie-teleologiese aard van die aksieteorie wat Joas se idee van kreatiwiteit uitbou, geanker is in 'n liggaam wat deur aangeleerde vermoëns en roetines op die omgewing reageer. Hierdie liggaam is nie anders as die een wat ek in §2 as die lyf van lyftegnieke beskryf het nie. Om die punt meer kategories te stel: daar is geen kreatiwiteit as dit nie innovering is op grond van 'n vertroude verhouding tot die wêreld nie, en laasgenoemde bestaan net danksy primêre tegnisiteit. Die omgekeerde is ook waar, en dit het ek implisiet betoog (§3.2) deur tegniese hermeneutiek onder die metafoor van "lees" te ondersoek: in alle tegnisiteit word die impuls van die lyf om in 'n omgewing op te tree deur min of meer gestandaardiseerde vermoëns gefasiliteer, maar die fasilitering het net in uitsonderlike gevalle of onder patogene omstandighede die effek van 'n patroonmatige herhaling van aksie - die tegnisiteit van aksie word gekenmerk deur kreatiewe verwerkliking van die lyf se aangeleerde vermoëns. Terwyl dit vir die doeleindes van aanbieding nuttig is om 'n mens se aandag eers tot die individuele agent te beperk, is die tegnisiteit van die mens veel meer kompleks. Die vorming, gebruik en verandering van lyftegnieke behels 'n desentrering vanuit die individuele agent se liggaam na verskillende sfere buite die tegnisiteit van die lyf. Deurdat die lyftegnieke altyd in simbiose met (meesal) nie-tegniese groothede funksioneer, word tegnisiteit noodwendig met die ander aspekte van menswees verweef. Ek wil graag vyf sulke dialektiese verhoudings uitwys, waardeur die tegniese agent aan die breër verskynsel van menswees deelneem. Terwyl die vaardigheid van lyftegnieke deur dissiplinering van die lyf tot stand kom, beteken dit nie dat die totale liggaam hierdeur onder die beheer van dissipline kom nie. Die blote gegewe van drif wat aan optrede 'n primordiale projekmatigheid gee, gaan tegnisiteit vooraf en bemoontlik die aanleer van tegnieke (selfs al sluit dit manipulasie van drif in). Maar andersins meng biologiese faktore soos moegheid, hormone of dieet in by die vermoë om lyftegnieke aan te leer en suksesvol te laat funksioneer. Die biologiese werking van die lyf mag wel passief ondergaan word, maar dit is ook moontlik om tegnies daarop in te gryp en selfs op wyses wat nie direk met die vorming van lyftegnieke te make het nie, byvoorbeeld in die gebruik van medisyne. Lyftegnieke mag in die lyf gesetel wees, maar dit word bekom deur herhaalde interaksie van die lyf met sekere objekte. Vertroudheid met 'n mens se tegniese vermoëns is 'n vertroudheid om tipiese dinge te manipuleer in antwoord op die eise van tipiese kontekste wat (onder andere) deur daardie dinge opgemaak word (hierdie "dinge" sluit veral objekte en tegniese artefakte in, maar ook "denkapparate" soos alfabette, die orde van getalle, begrip vir die dae van die week, ensovoorts). Daarom is tegniese aksie altyd interaksie met tegniese sisteme,12 eerder as met geïsoleerde tegniese middele. Die eienskappe van tegniese sisteme het weer 'n terugwerkende invloed op die vorming en aktivering van lyftegnieke. Die tegnisiteit van die lyflike agent is altyd die gevolg van sosiaal-gesitueerde interaksie en die invloed van implisiete of eksplisiete opleiding of goed- en afkeuring wat daarmee saamgaan. 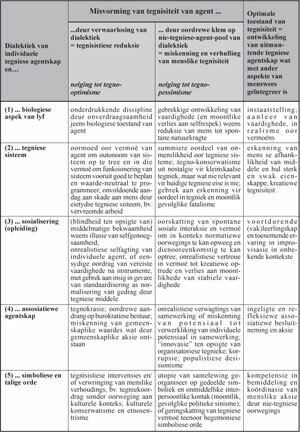 Daarom, hoe kontingent die historiese verloop van die ontwikkeling van 'n individuele agent se tegniese vermoë ook al mag wees, die agentskap van so 'n individu bly 'n gesosialiseerde agentskap. Gevolglik is mense geneig om op te tree op maniere wat tipies hoort by sekere sosiale kontekste, om objekte te gebruik wat met 'n bepaalde sosiale groep geassosieer kan word, en om so te doen met die oog op doelstellings wat meesal nie te vreemd vir mense van sulke groepe sal wees nie. Kortom, in die sin wat hierbo uiteengesit is, volg tegniese agente sosiale reëls. Die gevolg hiervan is die inoefening van 'n habitus wat deur die funksionering daarvan 'n mens retrospektiewelik as behorend tot hierdie of daardie groep(e) identifiseer - 'n feit wat egter geneig is om deur die verstrengeldheid van 'n mens se verskillende lewensverhale en dus verhoudings tot groepe, verdoesel te word. Die simboliese en talige orde of praktyk waarvan hier sprake is, is die wydste begrip van voorstellings wat bewustelik en soms onbewustelik deur die menslike verstand omgedra en bewerk kan word. Sulke voorstellings speel voortdurend in op die spontane vorming en aktivering van lyftegnieke en kan gesien word in beplanning, oorleg, doelbewuste oordrag van vaardighede, die bewuste beoefening van kontrakultuur, uitvinding, die onderwerping van tegniese sisteme aan nie-tegniese waardes soos veiligheid of skoonheid of die regverdiging van tegniese optrede. Hierdie "simbole" behoort dikwels nie net aan 'n enkele persoon nie, maar word deur mense gedeel. Verder is hierdie dialektiek van krag, ongeag die vlak van bewussyn van of die intensiteit van betrokkenheid by die betrokke talige praktyke deur die agente - dink byvoorbeeld aan die nie-beheerste en onbewuste inwerking van persoonlike aspirasie of ideologie op tegniese aksie. Op hierdie vyf maniere word die individuele tegniese agentskap as't ware organies met ander aspekte van menswees verweef (en nie maar net toevallig daardeur vergesel nie). Sonder inagneming van hierdie "ek-sentriese" aspekte van die individuele tegniese agentskap - die biologiese liggaam, die tegniese sisteme, die sosiale vorming en assosiatiewe aktivering en simbolies-talige intervensie - word die verskynsel van menslike tegnisiteit onherkenbaar misvorm. Die teenoorgestelde is ewe waar: nie een van hierdie aspekte van menswees kan geloofwaardig bedink word, sonder om die rol van die oorspronklike tegnisiteit van aksie daarin te erken nie. Tot dusver het die hele bespreking gegaan oor tegnologie as intelligente diskoers aangaande die tegnisiteit van aksie. Nou dat 'n oorsig oor die waarde en omvang van hierdie diskoers aangebied is, moet ek nog aantoon op watter manier hierdie diskoers "krities" genoem kan word. Uiteraard verwys die adjektief "krities" in die eerste plek na die ambisie en voortgesette poging om die verskynsel van tegniek op 'n akkurate manier te analiseer en binne die groter konteks van die menslike lewe te situeer. Die tweede moontlike betekenis van "kritiek" pas myns insiens egter ook by tegnologie: as diskoers oor 'n aspek van menslike bestaan, moet dit in staat wees om oordele te kan maak oor wat beter en slegter verskyningsvorme van menslike tegnisiteit is, dit wil sê dit moet die verwording van 'n aspek van menslike bestaan kan uitwys en kommentarieer, soos 'n mens dit met gesondheid of tussen-persoonlike verhoudings sou doen. Om die normatiewe potensiaal van 'n intelligente vorm van diskoers te regverdig, is 'n enorme taak, wat nie hier in enige detail uitgewerk kan word nie. Ek sal daarom daarby volstaan deur 'n aanduiding te gee van wat ek as die hartklop van so 'n kritiese diskoers beskou en tipiese oordele van 'n kritiese tegnologie in tabelvorm uit te pak. In 'n eerste stap is die normatiewe veronderstellings van 'n tegniek-kritiek Aristotelies van aard. Daardeur word veronderstel dat dit goed is vir mense om te kan optree en om in aksie te kan uitmunt. Dit beteken ook dat vergrype teen die tegnisiteit van aksie vergrype is teen die gees van die mens. Ek moet onmiddellik byvoeg dat ek natuurlik ook die mens se vermoë om optrede as regverdig of onregverdig te kan beoordeel, erken en goedkeur. Vanuit die perspektief van tegnologie, is dit egter die tweede stap. Buitendien, om ooreenkomstig 'n mens se oordele aangaande reg en onreg te kan optree, dit wil sê om daaraan werklikheid te gee, moet die oorwegings van tegnisiteit (bv. strategie, samewerking, aanwending van middele) onmiddellik in berekening gebring word.14 Dit is moontlik om uitmuntende aksie as normatiewe baken vir kritiek te neem - en dít, sonder om die moontlikheid van inperking deur oorwegings van reg en onreg te verwaarloos - omdat tegnisiteit nie sonder meer vanuit die middel-doel-skema bedink word nie. Daarom ook kan effektiwiteit en strategie nie sonder meer geneem word as die enigste normatiewe oorwegings aan die hand waarvan tegniese aksie gestuur moet word nie.15 Om tegniek suiwer in terme van effektiwiteit te beoordeel, is om dit tot die genoemde teleologiese vooroordele te verteken en uit die vyfvoudige implikasie met ander lewensfere te amputeer en sodoende geweld teen die "gees" van die mens te begaan. Negatief geformuleer, kan ek dus sê dat die kritiese inslag van tegnologie gerig is teen die tegnisistiese reduksie (dit wil sê, reduksie van menslike tegnisiteit tot 'n spesifieke tipe van aksie, wat boonop meesal deur die bril van die hierbo-bespreekte teleologiese vooroordele beskou word) én teen die anti-tegniese marginalisering van menslike tegnisiteit (dit is die poging om tegnisiteit uit menswees te ban of dit tot bepaalde tipes van aksie te beperk). Hierdie twee tendense van vertekening van die mens as tegniese agent sal meesal tegno-optimisme en tegno-pessimisme, onderskeidelik, tot gevolg hê. Positief geformuleer word tegnologie as kritiese diskoers oor menslike tegnisiteit gelei deur die begeerte om tot insig te kom in die volle moontlikhede vir die ontwikkeling van menslike agentskap, omdat dit 'n moontlikheidsvoorwaarde vir etiese, sowel as morele en politieke uitmuntendheid is. In hierdie sin het tegnologie dus 'n geesteswetenskaplike ambisie (in die sin wat in nota 1 gedefinieer is). In die tabel wat hieronder volg, probeer ek tipiese patologieë, wat as gevolg van 'n vertekening van tegnisiteit ontstaan, uiteen te sit. Dit spreek vanself dat hierdie bondige uiteensetting op 'n ander geleentheid deur 'n gedetailleerde bespreking en regverdiging opgevolg moet word; in die huidige vorm is dit wel voldoende om die kritiese potensiaal van "tegnologie" voorlopig te demonstreer. In die linkerkantste kolom word die tegnisiteit van die mens in die vyfvoudige dialektiek voorgestel. In die regterkantste kolom, word 'n idee gegee van wat die optimale werking van menslike tegnisiteit, ooreenkomstig elkeen van die vyf dialektieke, is. Die middelste twee kolomme verteenwoordig die twee variante van patologiese verhoudings tot menslike tegnisiteit. Die onderliggende struktuur van hierdie tabel weerspieël dus nie net die oormaat en tekort wat deur 'n oordeelkundige perspektief op tegnisiteit voorkom moet word nie, maar weereens, net soos in Aristoteles se praktiese filosofie, is daar 'n aanduiding van wat uitmuntendheid is, wat deur die vermyding van die twee euwels gevind word.16 Hierdie middeweg verteenwoordig die erkenning van die "gees" van menslike tegnisiteit deur daaraan die plek in die menslike bestaan toe te ken wat dit verdien. Een van die aspekte van uitmuntende menslike aksie is die vermoë om in verskillende kontekste en onder verskillende ordes van regverdiging aan hierdie gees te laat reg geskied - in die kritiese analise wat agterna deur die sosiale wetenskaplike daarvan gemaak word, maar eers en veral in die praktyk van menslike optrede. Ernst Wolff is professor in filosofie en werk in sosiale en politieke filosofie, fenomenologiese hermeneutiek en tegniekfilosofie. Na afloop van sy nagraadse studies in Johannesburg en Parys, doseer hy aan die Universiteit van Pretoria (sedert 2005). Van 2007 tot 2011 was hy fellow van die Kultur-wissenschaftliches Institut (Essen, Duitsland). Sy belangrikste publikasies is De l'éthique á la justice (Springer 2007), Political responsibility for a globalised world (Transcript 2011) en, as mede-redakteur met O. Kozlarek en Jörn Rüsen, Shaping a humane world (Transcript 2012). Ernst Wolff is professor of philosophy and works in social and political philosophy, phenomenological hermeneutics and the philosophy of technology. After his postgraduate studies in Johannesburg and Paris, he started teaching at the University of Pretoria (since 2005). From 2007 to 2011 he was a fellow of the Institute for Advanced Studies in the Humanities (Essen, Germany). His most important publications are De l'éthique la justice (Springer 2007), Political responsibility for a globalised world (Transcript 2011) and, as co-editor with O. Kozlarek and Jörn Rüsen, Shaping a humane world (Transcript 2012). * Die outeur bedank Dr. Vasti Roodt, Prof. Fanie de Beer en 'n anonieme keurder vir hulle waardevolle terugvoer. 1 In dit wat hier volg sal ek telkens die woord "gees" gebruik soos dit voorkom in die term "geestes-wetenskappe", verstaan as "menswetenskappe". Dienooreenkomstig verwys "gees" na dit wat op 'n gegewe tydstip as die beste voorstelling van die volle omvang van menslike bestaansmoontlikhede gegee kan word - dit wil sê 'n verantwoordelike antropologie, eerder as na 'n entiteit wat deur metafisiese spekulasie van die lyf onderskei moet word. 2 Daar is natuurlik ook tiperings van tegniek wat nie vertrek vanuit 'n beskrywing van tegniese artefakte nie (byvoorbeeld tegniek as onmisbare oorbodigheid, tegniek as produktiewe selfverwerkliking of tegniek as uitdrukking van die menslike drang om mag en om uitbuiting van die natuur - sien weer Lenk, ibid.) en dit sal duidelik word dat ek in hierdie artikel nouer aansluit by die antropologiese vertrekpunt van hierdie benaderings. 3 Ek het elders betoog dat die beoefening van deugde, anders as wat Aristoteles dit voorstel, 'n besliste lyftegniese aspek het (sien Wolff 2008:324-329). Selfs geestelike praktyke soos godsdiensbeoefening kan nie verstaan word as die lyftegniese aspek daarvan verwaarloos word nie (sien die uitstekende studie van Pottier 1990 en die veel eenvoudiger, maar plaaslike studie van Wolff 2009). 4 Die begrip van "vertroudheid" wat hier gebruik word, is ontleen aan Heidegger en is die sleutel tot die potensiaal daarvan om deur interaksie met dinge iets soos 'n wêreld te ontsluit; die term "wêreld" word dus ook hier aan Heidegger ontleen (sien veral Heidegger 1993:§16). 5 In hierdie opsig is my betoog oor tegnologie solidêr met Marx se kritiek van vervreemde arbeid in die Manuskripte van 1844. 6 Hierdie laaste insig is met fyn waarneming deur Robert Bresson (1988) geanaliseer in sy kontrastering van die tegniek van natuurlike akteurskap in film teenoor gespeelde akteurskap in teater. 7 Omdat ek hierdie saak elders reeds in meer detail bespreek het, bied ek hier slegs 'n bondige herformulering - sien Wolff 2010, maar ook die waardevolle uiteensetting oor die volg van reëls wat Charles Taylor (1999) na aanleiding van Wittgenstein en Bourdieu uitwerk. 8 So 'n betoog is presies wat ek onderneem het in (Wolff 2012), waar ek die hermeneutiese spiraal van tegnisiteit na analogie van Ricoeur se narratiewe teorie ontwikkel het. In dit wat hier volg, gee ek aspekte van hierdie betoog kortliks weer. Elders het ek ook probeer om die hermeneutiese aard van menslike tegnisiteit te beskryf met gebruikmaking van Ricoeur se algemene tekshermeneutiek (Wolff 2007). 9 Pragmatisme word juis deur Joas gekenmerk as 'n "teorie van gesitueerde kreatiwiteit" (1992:197). 10 Hierdie snyvlak stem ook goed ooreen met die bespreking van roetine in die tweede hoofstuk van Giddens (1984). 11 By implikasie definieer ek die oorspronklike tegnisiteit van aksie met verwysing na drie dinge: (1) die ingeoefende liggaamsvermoëns (of die wisselwerking tussen vermoë en onvermoë), (2) die strewe onderliggend aan aksie (Aristoteles se orexis) en (3) die noodwendige implikasie van die hermeneutiese of kreatiewe aspek van aksie in die ontplooiing van die lyftegnieke. Ek besef goed dat hierdie 'n nie-teleologiese idee van tegnisiteit is - iets wat maklik as nie net teen-intuïtief beskou kan word nie, maar ook met taamlike teenstand vanuit die geesteswetenskaplike tradisies begroet kan word. 'n Vollediger regverdiging hiervan val buite die doelstellings van die huidige opstel, maar ek glo dat die strekking van die betoog minstens die meriete van die prima facie argument vir so 'n beskouing van tegnisiteit kan uitwys. Hierdie definisie van die tegnisiteit van menslike aksie is nie ontwikkel met die doel om daarmee 'n onderskeid tussen menslike tegnisiteit en die tegnisiteit van ander diere te kan maak nie, tewens,die definisie kan waarskynlik ook tot 'n groot mate geldig wees (ten minste) vir die aksie van groot soogdiere, waar ek nie kan sien dat hulle optrede bloot binne 'n stimulus-respons raamwerk verstaan kan word nie. Hoewel dit buite die vraag van die huidige ondersoek val, kan ek minstens voorlopig aandui dat die dialektieke waarin lyftegniek met simboliek en tegniese middele opgeneem is (sien bespreking wat volg), 'n dramatiese graadverskil tussen die menslike tegniese vermoë en dié van ander diere teweeg bring. Saam met die spesifieke posisie van die mens se biologiese aard in die proses van evolusionêre ontwikkeling, is hierdie dialektieke verantwoordelik vir die onmiskenbare verskil tussen menslike tegniese aksie en dié van selfs die naaste primate en daarom vir die spesifieke hominisering van menslike tegnisiteit (sien my bespreking van Leroi-Gourhan en Girard as toegang tot die plek van tegniese middele en simbole in die proses van hominisering in Wolff 2006:231-236). Vandaar ook die belang daarvan om die tegnisiteit van menslike aksie binne die verweefdheid daarvan met ander antropologiese aspekte te ondersoek, soos ek van die begin van die opstel betoog.Dit moet hieruit ook blyk dat my betoog wel versoenbaar is met pogings soos dié van Richard Sennett (2008) om die waarde van vakmanskap te rehabiliteer, maar 'n fenomenologies oorspronkliker en daarom sosiaal-teoreties breër ambisie het. 12 'n Uitstekende bespreking van die sistemiese aard van tegniek, oor die hele reeks van groottes, is Günther Ropohl (1999). 13 Die analise van die assosiatiewe aspek van agentskap is 'n heel moeilike probleem in die fenome-nologiese tradisie, van waaruit ek hier tot 'n sekere hoogte dink. Heidegger se begrip vir gemeenskaplike bestaan (Mitsein) en die ooreenstemmende idee vir die gemeenskaplike betekenishorison van aksie (onder die begrip "Mitwelt") bly relatief onder-ontwikkel (sien 1993:§§25-27) en Merleau-Ponty se begrip van tussenlyflikheid (intercorporéité) word ook nie in detail vir 'n aksieteorie uitgewerk nie (1960:282, 1964:183). In sy laaste boek toon Ricoeur duidelik aan wat die plek is wat kollektiewe agentskap in sy hermeneutiek van die bekwame mens (l'homme capable) moet inneem, en maak waardevolle voorstelle in hierdie verband, maar selfs in die ontwikkeling van hierdie boek bly kollektiewe agentskap taamlik wees (2004:215-232). Dit spreek vanself dat hierdie tema op 'n ander plek afsonderlik hanteer moet word. 14 By gebrek waaraan mens 'n eenvoudige, 'n werklikheidsvreemde etiek van beginsels (Gesinnungsethik) beoefen. Hierdie probleem is aan die orde gestel deur Weber (1999:435-450), gekommentarieer deur Schluchter (1971) en vorm 'n sentrale tema in Wolff (2011:175-266). 15 Dit sou waarskynlik moontlik wees om - in 'n verdere studie - aan te toon dat die regverdiging en oordeel oor tegniese aksie onderhewig is aan dieselfde pluralisme van ordes van regverdiging as waaraan aksie oor die algemeen onderhewig is. Boltanski en Thévenot (1991) identifiseer ses sulke ordes (inspirasie [kuns en godsdiens], familie, opinie, burgerskap, mark en industrie) wat myns insiens elkeen op 'n onderskeie manier die tegniese vermoë van die mens in 'n projek en 'n raamwerk van regverdiging, beoordeling, veroordeling en kompromie inbind. 16 Die strekking van my betoog - en in aansluiting by Wolff (2008) - is egter om die vraag oor die kompetensie wat 'n mens in staat sou stel om telkens die middeweg tussen die twee euwels te vind, nie aan 'n aksie tipologie van techné enfronésis toe te vertrou nie, omdat dit aan geeneen van hierdie aspekte van menslike agentskap reg laat geskied nie.